ORGANIC You need not worry about harmful chemical compounds sneaking into your meals, as pesticides are absent during cultivation and pressing processes. Instead, Myrolion chooses to employ natural and age-old techniques. 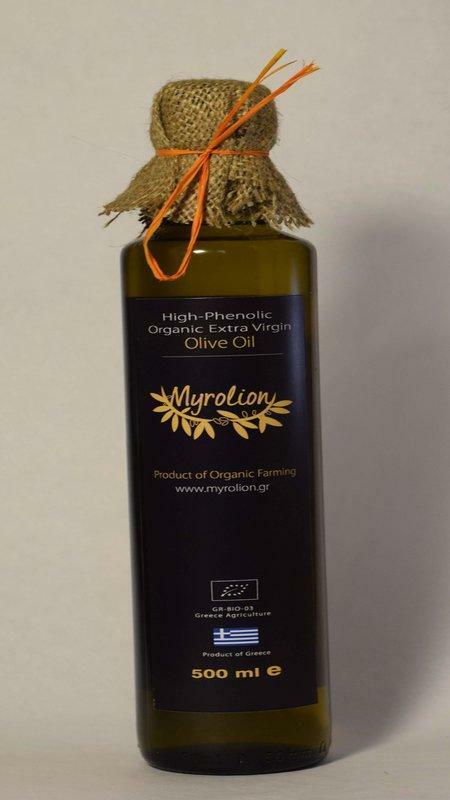 EXTRA VIRGIN With extremely low acidity and aromatic delectability, Myrolion will only encourage a healthy diet. Our olive oil is obtained directly from olives, using solely mechanical means. HIGH-PHENOLIC High concentrations of Oleocanthal and Oleacein turn our olive oil into a great way to brace yourself against oxidative stress, among other health benefits such as cardioprotective and neuroprotective activity. (Health Claim) AWARD WINNING Our family's hard work was recognized in the Olympia Health and Nutrition Awards, supervised by the World Olive Center, that took place on May the 11th 2017 in Athens, Greece, days after our company's official start-up! Myrolion received a Bronze Standard of Excellence for its health protecting properties.